Brantford, Ontario, January 29, 2019 (www.linkgreen.ca). LinkGreen is pleased to announce a strategic partnership with The Branding Company, a promotional partner providing programs and services in supporting business developments for many leading North American businesses. This partnership will bring together both companies in providing a wide range of expanded service offerings to our customers. The Branding Company provides branded promotional items and incentive programs to mid-size and Fortune 500 Companies. The Branding Company provides its clients with products and incentive solutions designed specifically for each client to help them reach their sales and marketing objectives. 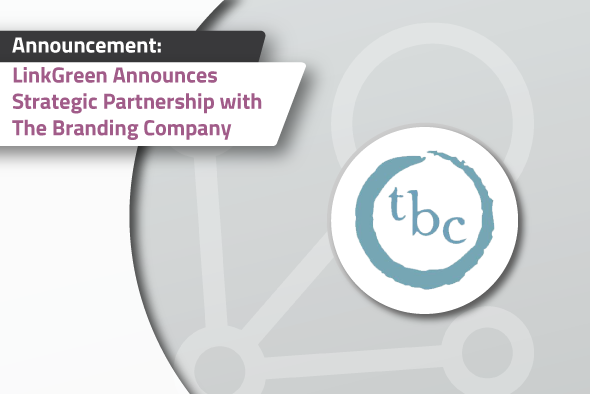 This new partnership will allow them to continue to deliver leading products and services that set them apart from other promotional merchandising businesses. This new partnership also presents the opportunity for LinkGreen to provide loyalty program offerings that complements the online ordering solution. This could lead to B2B loyalty plans for suppliers in a streamlined and cost-effective manner that wouldn’t be possible with existing manual ordering processes. LinkGreen will deliver an online ordering experience that is tailored specifically for each of their clients. Through this partnership, customers will have the opportunity to gain access to a personalized online ordering experience with their own online catalog based on their product preferences and convenient access to online order history while delivering exceptional efficiency to the order management process. LinkGreen (www.linkgreen.ca) is a technology solution that connects industry supply chains to make wholesale buying and selling fast and easy. The company has created a fully connected and integrated supply chain that provides innovative operational efficiencies, modern sales, and marketing opportunities, and familiar digital ordering experience for suppliers, distributors, and retailers. Now in its fourth year of operation, LinkGreen serves multiple industries, including Lumber & Building Materials, Greenhouse, Nursery & Floriculture, Lawn & Garden, Cannabis, and Home Decor. With over $1 billion in vendor supply available, there are more than 4,800 registered wholesale buyers who now enjoy an electronic supply chain. The Branding Company (http://www.thebrandingcompany.ca) specializes in creating and offering innovative promotional, branded incentive rewards and management programs that work. An award-winning company with more than 100+ combined years of experience, they have created simple and complex promotional and merchandise incentive programs. Their clientele ranks from mid-size companies to Fortune 500’s and covers a wide range of industries from transportation to colleges & universities.